And... this is what I wore this to the Stacy London book-launch (from my previous post). I found this top at Violet Boutique in Adams Morgan. I love the color blocks and the sheer, silky fabric. When paired with a camisole, blazer and tailored pants, it can be worn to office. For a night out with the girls or a date with my husband, I'd wear it with leather and a dark bra. What do you think? Is a sheer blouse trashy or classy? Want my look? Click on the images below for similar/the same pieces. Those pants are so fab! Love love. I think this look is great! Took me a bit to get behind the dark bra with sheer shirts, but you pulled it of well!! And LOVE those pants! H&M is amazing. the top is perfect. 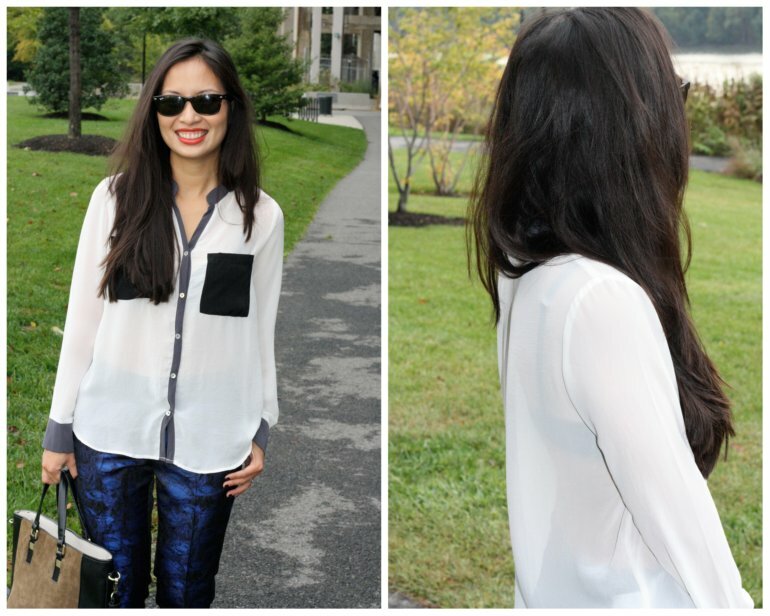 i'm all about classy sheer tops! Great outfit. Love the bold color of the pants.